Select a tab to find more details about MtG at BBC! Entry for this event is ZERO dollars! Players will be entered into swiss pairing rounds, similar to FNM. For each round won, you'll receive 1 booster pack! Win all your matches, and receive a special Standard Showdown pack as well! Additional Standard Showdown packs will be given out as random prizes as well! * There will be no Standard Showdown event for the weekend of the Event Weekend. It's prerelease time again! War of the Spark concludes (maybe!) the battle between Nicol Bolas and the Gatewatch. Cost for each single player event is $25. Once the tournament begins, each player will receive a prerelease kit. All Magic cards within the kit (including any valid promo cards) will be part of the player's card pool for the event. Additional basic lands will be provided by the store. Using the provided card pool, players will construct a minimum 40-card deck. Prerelease events are considered 'Continuous Build,' meaning players can change their decks using their card pool to any configuration after the event has started. They do not have to register their deck or return it to its original configuration at the start of each round. Once players have constructed decks, players will be paired against one another in Swiss Rounds. The number of rounds will be determined by the number of players (Note: Midnight events have a hard cap of 4 rounds). There will be no Top 8/4 for any prerelease event. Rounds are best 2 out of 3 games in 50 minute timed rounds. Players will receive 3 points for winning a round, 1 point for a draw, and 0 points for a loss. For each player participating in the event, 3 packs of War of the Spark will be added to the prize pool. Additional random prizes will also be added, including gaming accessories, store credit, and IOUs for boxes of product (redeemable when the set releases). At the end of the tournament, equal pack prizes will be awarded to players with equal points; if a player goes 3-1, they will receive the same prize as any other player with the same record. All players that stay until the end of the tournament will receive 1 pack as a prize. Random prizes will also be handed out at that time. Cost for each event is $50 per TEAM. Once the tournament begins, each team will receive two prerelease kits. All Magic cards within the kits (including any valid promo cards) will be part of the team's card pool for the event. Additional basic lands will be provided by the store. Using the provided card pool, teams will construct two minimum 40-card decks. Prerelease events are considered 'Continuous Build,' meaning teams can change their decks using their card pool to any configuration after the event has started. They do not have to register their deck or return it to its original configuration at the start of each round. Once players have constructed decks, teams will be paired against one another in Swiss Rounds. The number of rounds will be determined by the number of teams. There will be no Top 8/4 for any prerelease event. Rounds are single game matches in 50 minute timed rounds. Teams will receive 3 points for winning a round, 1 point for a draw, and 0 points for a loss. Teams start with a shared life total of 30. Even though this is a multiplayer format, the team going first DOES NOT draw for their first turn. Attacks and blocks are done as a team. If there is a relevant effect that is being used (or could be used), it must be made clear which creatures are attacking which player; ie, if an effect states that all creatures that deal combat damage to a particular player at the end of combat, the attackers must declare which player they are attacking. For each team participating in the event, 6 packs of War of the Spark will be added to the prize pool. Additional random prizes will also be added, including gaming accessories, store credit, and IOUs for fat packs of product (redeemable when the set releases). At the end of the tournament, equal pack prizes will be awarded to teams with equal points; if a team goes 2-1, they will receive the same prize as any other player with the same record. All teams that stay until the end of the tournament will receive 2 packs as a prize. Random prizes will also be handed out at that time. For each event a player participates in, $5 will be reduced from the entry fee for the tournament. For example, if a player participates in the Saturday midnight and the Saturday 7PM 2HG event, the Midnight event will cost $25, and the 2HG event will cost $45. If both players in the 2HG event played in a previous event, then their team cost is only $40! For the crazy souls that want to play in all 6 events, we'll take $5 off the first event too! To receive this discount, a player must preregister AND pay for all events before the first event. If a player can't make an event, we'll refund their money for the missed event, less the discount amount. More details about Prereleases can be found on the WotC Website. If you have any other questions, ask Dave! New set, let's Draft! The new Draft Weekend gives players an opportunity to meet up and draft the new set. Also included are special promos for winning your draft pod! Entry for this event is 4 packs of War of the Spark per player. 3 packs will be used for the draft, and 1 pack will be included in the prize pool. The store will add 2 packs, for 10 packs total. Each draft pod will be 8 players. These pods will be single elimination matches. Win 1 match and receive 1 pack; 2 wins receive 3 packs; 3 wins receive 5 packs and the special promo. Drafts will continue until we decide to stop! This is the same weekend as Free Comic Book Day, but for Saturday, I'll save us space to draft. Sunday May 5th @ Noon - FREE! Want to learn to play Magic? Got questions about War of the Spark? Want to learn more about the Prereleases? Just want to hang out? Come on down to the Open House! This is a causal meet-up event for players of all levels to come down to the store and check out the game. Intro decks will be available for new players to try out the game! Veteran of the game? Bring a friend to the Open House and receive a foil Promo! Two things; Yes, this event is AFTER the Prerelease, for ... reasons. Also, Yes this event is on SUNDAY, because Saturday is Free Comic Book Day, and ... yea, no. Saturday, May 25th @ Noon - $?? Event Weekends are the new mid-of-season events that invite players back for promos and exclusive goodies! Now that players have had a chance to play with and against the new cards, it is time to show what you've learned. Compete for the title of Store Champion! No idea. Wizards has said this will be a special event, and as of this update, I don't have any details. I'll update this page once I have more info. tl:dr - MODERN Tourneys every week, casual events as requested. $5 to Enter - Starts at 7pm. The format for this event is MODERN. The current ban list for this format is available here. 2 packs per player in the prize pool, and the same record always gets the same amount of prize. Pack prizes will go to players with a BETTER than 50% record, and we will also have random prizes at the end of the tourney as well. Top two finishers minimum will receive a promo card. If we have more than two with first-place records, all players with that record will receive a promo. We'll take sign ups for casual events at the counter. Sign in your name and what type of event you would like to play (examples listed below). If we get close to enough players interested in an event, we'll announce that a game is forming, and sign people up from there. The minimum number of players for any casual event will be 4 players. Sealed events like draft will need 8 players. Once a group has been made, players will need to make a choice on whether they would like to play for promos only, or additional pack prizes as well. If players want to play for a promo ONLY, then there will be no fee. If players want to play for packs, then there will be an appropriate fee (details below). 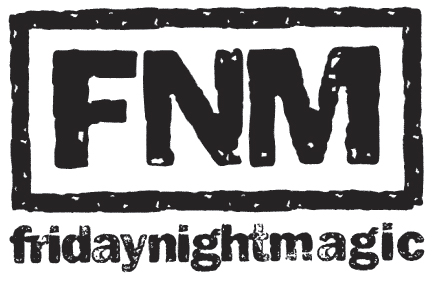 The first place finisher will receive a FNM promo, whether or not there was an entry fee. All casual events need to begin before 10pm*. Any remaining promos not reserved for casual events will be distributed randomly to players in the Modern tournament (limit one promo per player per tournament). * Traditionally, there is a booster draft after FNM for players in the Modern tournament. If there is a draft that will begin after the Modern tournament finishes, a promo will be given to the first place finisher of that draft. Please realize that is a new take on FNM, so things are still pretty fluid on how to handle this. This is a basic guideline for events, and could change based on player feedback. Every Tuesday starting around 6pm - FREE! Meet up for some casual fun every week! Commander is Magic's most popular casual format, and we have a dedicated night to shuffle up and play! We recognize the official Wizards of the Coast sponsored rules for deck construction and play. Details about these rules can be found here at MtG Commander Dot Net. As an official WPN affiliated store, playing with proxies is not permitted at our in-store events. Even though this is a causal format and this event is unsanctioned, WotC does not permit any counterfeit or proxied cards at its WPN affiliated stores. Remember, this is event is FREE every week! Just meet up in the game room and have fun! Bell, Book and Comic is happy to trade with you! Bring your cards in to us and we will take a look and see if we can make a deal! As some general guidelines, most often we will trade for in-store credit only. We will make cash offers for large collections, or specific older cards for Legacy and Vintage formats.